PRINT ENTITLED: "Arbor myristica fæmina". PUBLISHER: Jan Rieuwertsz, Amsterdam, Holland. ARTIST/ILLUSTRATORS: Abraham Munting; Joseph Mulder & Jan Goeree. DATE OF PUBLICATION: 1682, 2nd Ed. [1672 (1st Ed.)] . SCOPE AND PURPOSE OF PUBLICATION: A text of botanical interest. COLORING:	Hand Coloring (later coloring). HISTORY: Abraham Munting (1626~1683) was a Dutch physician, later becoming a famous botany professor at the Academy of Groningen, Groningen, The Netherlands. At age 32, he was appointed the director of Hortus Botanicus in Groningen, a position he retained until his death. His book Waare oeffening der planten, waar in de rechte aart, natuire en verborgene ....was originally published in 1672, enlarged into a second edition in 1682. Published posthumously in 1696, Munting's final book Naauwkeurige Beschryving Der Aardgewassen was a significant refinement and expansion of his earlier works ~ containing 245 illustrations. Although Waare oeffening der planten,...contains extensive textual information pertaining to a large variety of plants, only 40 botanical engravings illustrate his work. Munting's stylized engravings are praised for their artful surrealistic quality. His engravings are considered beautiful works of art. Joseph Mulder and Jan Goeree are also credited as minor artistic contributors to the work. Observing the "Arbor myristica fæmina" engraving, notice that the flowers do not actually resemble the tiny white buds found on an actual nutmeg tree. Instead, Munting depicts large, billowing flowers which are complete fabrications by the artist. 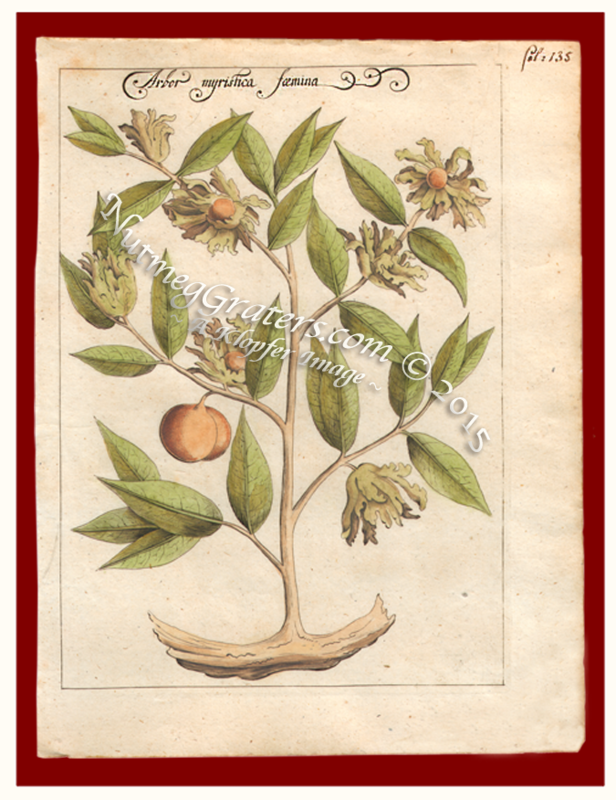 This use of these over-sized flowers in the depiction of the nutmeg tree are noted among other engravings by European artists of the late seventeenth century.